A 4-room apartment with an area of 167 sq. 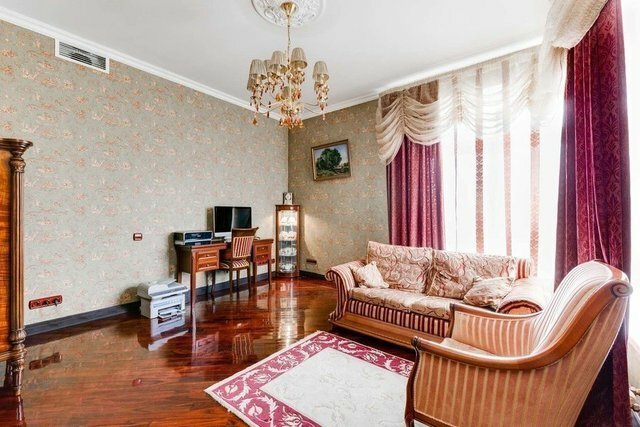 m. in the Residential Complex “Triumph Palace” is offered for sale. The apartment is fully furnished. Renovated in an expensive classic style. There is all the necessary appliances from leading manufacturers installed. Air conditioning and forced-air ventilation, heated floors. The apartment offers the beautiful view to the inner apple orchard. Functional layout: kitchen-dining room, hall, 3 separate bedrooms with its own bathroom each, corridor, laundry room. “Triumph Palace" is a residential complex, based on the idea of reviving the 50s and the continuation of the best traditions of Stalin’s high-rises.